This week the Library History article is an abridged reprint of an article which appeared in the Three Rivers Commercial News on April 2, 2018. We share it here with permission from the Three Rivers Commercial News editorial staff and from Managing Editor Alek Frost, who wrote the article. 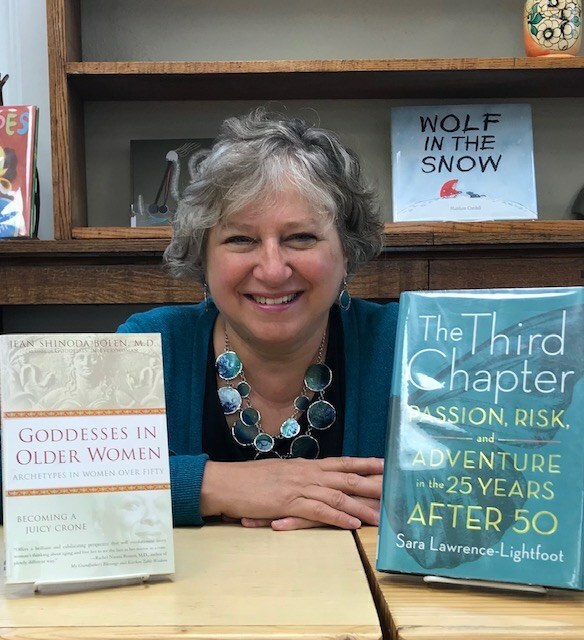 Christine Nofsinger has served as the director of the Marcellus Township Wood Memorial Library for 22 years, and in addition to providing continuity and sound leadership, Nofsinger has promoted civic engagement through a variety of avenues both within and beyond the walls of the library. Whether it’s making kits to help improve living conditions for Syrian refugees, creating a “network of support” for prisoners through the exchange of letters, or making quilts to donate to the Michiana Mennonite Relief Sale, Nofsinger uses her role at the library, and her place in the community outside of it, to make a difference. “Here’s the thing that’s so great about working in the library: I’m surrounded by stories, and stories connect us with each other. I’m surrounded by the written story but also the stories of all the people that come through these doors. I think that is the sort of universal human experience that connects us, that pulls us together,” she said. Years before Nofsinger served on the Marcellus library board or accepted the library’s director position, she was a teacher. She received her bachelor’s degree in elementary education from Goshen College, and later taught school in Botswana in Southern Africa for three years, which she says changed the way she viewed the world. “We lived with a family in a settlement outside of the capital city, and I still maintain contact with them, made easier by Facebook, so it’s really great. I’ve gone back a couple times to see them, and they’ve come here. So that sort of expanded my worldview,” she said. Nofsinger, who’s originally from Chesapeake, Virginia, values her community and strives to make a difference where she lives, but she also sees herself as a citizen of the world and aims to assist others regardless of where they call home. In April of this year, the library celebrated International Awareness Month. Library book displays and programs helped patrons of all ages to learn about the many different people who live in the world, with a special emphasis on refugees. One library project provided an opportunity for patrons to assemble hygiene kits for Syrian refugees. Many community people, including the girls who participate in the American Doll teas at the library, donated soap, towels, combs, tooth brushes, and nail clippers for the kits. Patrons and library staff sewed drawstring bags made of cloth to hold the items. A variety of people came to the library to fill and prepare the bags for shipment to refugee camps. When Nofsinger isn’t involved in learning new things or in service work, she runs a successful library. The Marcellus library received a “Citation of Excellence” from the Library of Michigan Foundation in 2015, and in 2005 Nofsinger was awarded the Rural Libraries Conference Public Services Award. In 2017, Nofsinger was selected as that year’s Hometown Hero by the Modern Woodmen Fraternal Chapters of Marcellus. The library received a $100 gift from the Woodmen in honor of Nofsinger’s role in the community. In 1896, the library’s collection totaled 234 books and 3 magazines, and 180 people paid fees to join the Ladies’ Library Association. In 2017, the Marcellus library’s collection totaled 29,583 items, with a circulation count of 17,345. 2,219 people participated in programs offered by the library. Nofsinger says she likes to think of the Marcellus Township Library as a “safe place” for kids and adults alike, and she takes pride in watching children develop from preschoolers to college graduates.